Magnetic resonance-guided focused ultrasound surgery (MRgFUS) allows for precisethermal ablation of target tissues. While this emerging modality is increasinglyused for the treatment of various types of extracranial soft tissue tumors, ithas only recently been acknowledged as a modality for noninvasive neurosurgery.MRgFUS has been particularly successful for functional neurosurgery, whereas itsclinical application for tumor neurosurgery has been delayed for varioustechnical and procedural reasons. 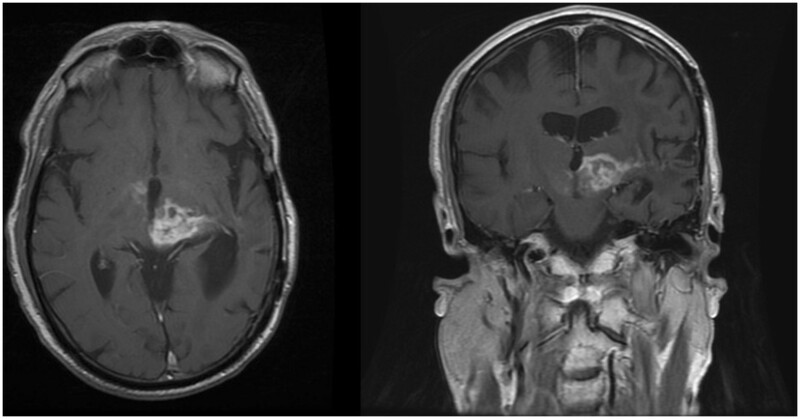 Here, we report the case of a 63-year-oldpatient presenting with a centrally located recurrent glioblastoma who wasincluded in our ongoing clinical phase I study aimed at evaluating thefeasibility and safety of transcranial MRgFUS for brain tumor ablation. Applying25 high-power sonications under MR imaging guidance, partial tumor ablationcould be achieved without provoking neurological deficits or other adverseeffects in the patient. This proves, for the first time, the feasibility ofusing transcranial MR-guided focused ultrasound to safely ablate substantialvolumes of brain tumor tissue. High-intensity focused ultrasound (HIFU) can penetrate soft tissue to producephysiological effects at the target while sparing healthy tissue. Integration withmagnetic resonance (MR) imaging for closed-loop intervention guidance, i.e.,MR-based intra-interventional targeting, continuous temperature monitoring andlesion creation, and finally, lesion assessment, makes HIFU, or in this context,transcranial MR-imaging-guided focused ultrasound (tcMRgFUS), an ideal modality fornoninvasive brain interventions . It does not involve ionizing radiation, is not limited by trajectoryrestrictions, and is not preclusive for later MRI diagnostics and treatment options.Several clinical phase I trials have demonstrated the feasibility and safety ofusing tcMRgFUS to treat a variety of functional brain disorders, such as chronicneuropathic pain , essential tremor [3, 4], or tremor-dominant Parkinson's disease  through thermal ablation of thalamic and subthalamic targets withsubmilimeter precision . Accordingly, the InSightec Neuro system used in these trials received CEmarking for functional neurosurgery by the end of 2012. While the noninvasivetreatment of brain tumors has been the driving vision for the advancement of HIFUtechnology for decades [7, 8], earlier clinical studies in this field lacked proper image guidance , required a craniotomy to create an acoustic window through the skullbone , or had limited success due to the technical limitations of the FUSsystems available . Here, we report the successful application of noninvasive tcMRgFUS forpartial brain tumor ablation in a patient suffering from a centrally locatedmalignant glioma. A 63-year-old patient presented in our clinic with tumor recurrence in the leftthalamic and subthalamic region 5 years after first surgery for a posteromedialtemporal lobe glioblastoma (GBM) (Figures 1 and 2A-C). Surgical resection was excluded as a treatment option dueto the location of the recurrent tumor within eloquent brain areas and inconsideration of previous radiotherapy and numerous cycles of variouschemotherapeutic agents. On neurological examination, the patient was fullyorientated with a Glasgow Coma Scale of 15. He showed a right-sidedfacio-brachio-crural 3/5 hemiparesis (medical research council scale)  and a slight esophoria and ptosis of the right eye without additionalcranial nerve disorders. MR angiography did not reveal pronounced vascularizationwithin the tumor region that would imply an intolerable risk of bleeding duringtumor ablation. After giving informed written consent, he was included in ourongoing clinical phase 1 study on the feasibility and safety of tcMRgFUS for thetreatment of brain tumors . Coronal MR sequences of the tumor as depicted on the operatorworkstation. Console (left image). Blue marked areas correspond tocompleted sonication volumes; the area within the green frame illustratesthe consecutively planed treatment target. Thermometric mapping (rightimage) shows a rapid drop of temperature within the tissue target aftersonication. The tcMRgFUS procedure was performed using a mid-frequency ExAblate Neuro®system (InSightec Ltd., Haifa, Israel) operating at 650 kHz that was interfaced to aclinical 3 T MR system (GE Healthcare, Little Chalfont, Buckinghamshire, UK). Thepatient received local anesthesia for the positioning of a stereotactic frame(Integra LifeSciences Corporation, Plainsboro Township, NJ, USA) and prophylacticadministration of paracetamol and ondansetron to prevent pain or nausea. Noadditional medication was applied during the intervention. The patient was awake andresponsive during the whole intervention. Repeated neurological assessments before,during, and after the intervention revealed stable neurological conditions and notreatment-related adverse neurological symptoms. Towards the end of the 5-hintervention that included more than 4 h table time in supine position in the MRscanner, the patient was tired and exhausted. He recovered quickly after the end ofthe intervention when he was released from the frame. For post-operative follow-up,the patient spent 1 night in the hospital and left on his own wish the following dayin good condition. The tcMRgFUS intervention process has been described in detail elsewhere . In short, T2- and T1-weighted (T1W) anatomical MR images were acquiredto register the FUS system coordinate space into the MR coordinate space. To clearlyvisualize the anatomical features of the tumor, pre-operatively acquired T1weighted, contrast-enhanced (T1W + C) MR images were also registered.Furthermore, a pre-operatively acquired high-resolution CT data set of the patienthead was registered to the MR images for subsequent acoustic modeling and correctionof skull-induced acoustic distortions by the FUS system software. Thermal tissueablation was achieved by transmitting pulses of focused ultrasound (sonications) of10–25 s duration and 150–950 Watt acoustic power into the targeted tumortissue where acoustic attenuation converted acoustic energy into heat. Since asubstantial part of the transmitted acoustic energy is absorbed in the patientskull, cooling periods of several minutes are required between sonications toprevent adverse thermal lesions in the skull bone, the adjacent tissue, and themeninges. Sonication target coordinates and sonication parameters, such as pulseduration and acoustic power, were individually prescribed in the FUS system userinterface after careful evaluation of pre- and intraoperative MR images and thermalresults of previously conducted sonications.A total of 25 sonications were appliedwith increasing acoustic energy up to 19,950 J per sonication. Intra-interventionalMR thermometry allowed to classify 17 of the applied 25 sonications as coagulativeaccording to achieved peak temperature above 55°C with a maximum peaktemperature of 65°C and calculated thermal dose above 240 CEM 43°C(cumulative equivalent minutes at 43°C) (Figure 1).According to the purpose of the clinical study, the treatment was terminated whenintra-operative real-time MR thermometry and calculated thermal dose maps predictedsuccessful ablation of substantial tumor volumes, thereby having established theclinical feasibility of the procedure. Post-interventional assessment includedneurological examinations and MR imaging immediately, as well as on days 1, 5, and21 after the procedure (Figures 2, 3, 4 and 5). MR imagesacquired immediately after the intervention revealed multiple isolated lesions inthe sonicated tumor tissue that were particularly well visible as bright zones indiffusion weighted images (DWI) (Figure 4). At this time,no distinctive lesions could be identified in T2W, whereas on T1W images, fainthypointense spots within the sonicated areas were newly detected. MRI on day onepost-sonication was acquired without contrast enhancement and did not reveal signsof collective intracranial hemorrhage on susceptibility weighted images or perifocaledema at the sites of ablated tissue. On day 5 post-op, T1W + C MRIshowed new, well circumscribed areas of nonenhancing volumes at the location ofsonicated tumor tissue. These volumes exhibited high DWI signals as typically seenin nonperfused, thermally coagulated tissue (Figures 3and 4). The total volume of these areas calculated by manualdelineation on T1W + C MRI was 0.7 cc corresponding to 10% of the totalenhancing tumor volume of 6.5 cc. Neurological examination on day 5 post-op showedan improvement of the patient's hemiparesis of the right arm (lifting above shoulderlevel now possible) and a resolution of the ptosis of the right eyelid. No newtreatment-related neurological deficits were observed. The follow-up MRI on day 21demonstrated unchanged areas of ablated tumor tissue and no signs of tumorprogression (Figure 5). No neurological deterioration wasevident 8 weeks after the procedure. Pre- (A, B, C) and post-interventional (D, E, F) MR findings. Axial,coronal, and sagittal contrast-enhanced T1-weighted, fat-saturated 3D VIBEsequence (TR = 6.2 ms; TE = 2.38 ms; flipangle = 12°; acquisitionmatrix = 320 × 320 pixels, sectionthickness = 0.9 mm) depicts a contrast-enhanced tumor with aprogressive necrotic center in the post-interventional follow-up after 5days. Pre- (AA-AC) and post-interventional (AD-AF) MR findings. Axialdiffusion weighted single-shot echoplanar imaging (A, D)(TR = 4,900 ms; TE = 130 ms; flipangle = 90°; acquisitionmatrix = 192 × 192 pixels, sectionthickness = 5 mm; spacing between slices: 6.5 mm; diffusiongradient approximately 0 and 1,000 cm2/s), corresponding ADC map(B, E), and axial flow-compensated 3D gradient-echo image (C,F) (TR = 49 ms; TE = 40 ms; flipangle = 15°; acquisitionmatrix = 224 × 256 pixels, sectionthickness = 2.0 mm) illustrate a discrete intratumoral diffusionrestriction in contrast to the notable intratumoral susceptibility in thepost-interventional follow-up after 5 days. DWI image 30 min after intervention revealed significant damage to thesonicated tumor tissue. A total of 25 sonications were applied withup to 19,550 J, 17 sonications reached ablative temperatures >55°C witha maximum of 65°C. MRI findings on day 21 after sonication of the tumor. Axial (TR = 766ms; TE = 20 ms; acquisition matrix = 512 × 512 pixels, sectionthickness = 5.0 mm) and coronal (TR = 500 ms; TE = 9 ms; acquisition matrix= 512 × 512 pixels, section thickness = 5.0 mm) contrast-enhancedT1-weighted sequences image demonstrating stable findings after sonicationof tumor tissue. The case presented in this report is the first successful noninvasive brain tumorthermal ablation performed with MR imaging-guided HIFU. These preliminary resultsconfirm the potential of tcMRgFUS for the noninvasive treatment of patientssuffering from malignant brain tumors, especially in areas not amendable forconventional neurosurgical interventions. The first successful intervention was preceded by two prematurely aborted attempts inanother patient who is included in our ongoing phase I study. Notably, the settingsfound during these unsuccessful trials were more complex. The patient had a catheterwithin a cystic portion of the centrally located tumor, which had to be excludedfrom the sonication pathway. Although the evaluation of preliminary scans wasencouraging, eventually, the intervention had to be terminated because of unreliableMR thermometry data. We suspect that a small ferromagnetic contamination at thecatheter tip induced local inhomogeneity that interfered with thermal measurements.The second attempt in the same patient was planed following a 10-month period aftertumor regrow was asserted. The catheter was removed prior to the intervention.However, due to the clinical condition, physically, the patient could not toleratethe motionless position over the time required for the intervention. Therefore, noablative sonication was performed. First attempts to evaluate the physical phenomenon of HIFU for clinical use inneurosurgery in the 1950s  were hindered by a lack of visual monitoring, thermometric control, andinability to determine the exact focal point. Today, it is possible to combine thedelivery of ultrasonic energy with MRI guidance, allowing thermometric monitoringand accurate targeting. MRgFUS has been approved and is increasingly used to treatpatients noninvasively for uterine fibroids and bone metastasis [14, 15]. Additional applications are currently being evaluated in a number ofadvanced clinical studies . The first attempts to treat brain tumors with image-controlled ablativeHIFU were completed in Israel in 2002 in a phase I/II study . At that time, a bony window had to be established through a smallcraniotomy in order to allow penetration of ultrasonic waves. It was an invasiveprocedure and the patient required general anesthesia during sonication. However,the ability to devitalize tumor tissue through ultrasonic thermal coagulation wasdemonstrated, and the histological analysis of the treated tumor showed coagulativenecrosis with sharp delineation between viable and thermally coagulated tumor. Asreported in 2010 by McDannold et al. , the first clinical evaluation of noninvasive tcMRgFUS for malignantbrain tumors proved the feasibility of focusing an ultrasound beam transcraniallyinto the tumor mapping heating with real-time MR temperature imaging. The study waslimited by the capacity of the device (Insightec, ExAblate 3000) at that time.Despite reaching maximum acoustic power of 800 W, the overall maximum focaltemperature within the tumor was only 51°C. Thus, no thermal coagulation couldbe achieved, and no changes resulting from treatment were evident in the tumor orsurrounding brain tissue, as seen in MRI acquired post-tcMRgFUS. It has beendemonstrated that temperatures of 55°C and above are needed to denatureproteins permanently and achieve tissue devitalization [17, 18]. Current transducer technology and refined software enable sufficientnoninvasive penetration of therapeutic HIFU through intact skin and calvaria. While there is ample evidence to show that tumor tissue can be permanently destroyedusing HIFU, one concern is that tumor mass will indeed be reduced throughcoagulation of tissue, but not completely eliminated—as aimed for withconventional surgery. Although evidence from HIFU therapy for uterine fibroids -which consist histologically of markedly firmer tissue than gliomas - shows that 12months post-thermal ablation, tumor volume reduction can reach over 50% , the long-term effects of thermal ablation on the former glioma tumormass are not known. Even though the space-occupying and displacing effect of gliomasis obviously of concern, neurological symptoms are often caused to a greater extentby perifocal edema in otherwise unaffected tissue (evidenced by the dramaticimprovement of symptoms frequently observed with steroid therapy) and bynonresectable tumor infiltration within brain parenchyma. In contemporary GBMtreatment, there is no question that timely cytoreductive surgery is the key toachieving substantial tumor control, though, ultimately, the infiltrative tumormargin zones are only accessible therapeutically by radiation and chemotherapy . Survival of GBM patients is therefore greatly influenced by the locationand the operability of the tumor. Alternatives to conventional surgery for obtainingimmediate and safe tumor reduction and destruction are much needed for a largenumber of patients. The tcMRgFUS technology available today has several shortcomings preventing its broadapplication in brain tumor treatment. One main disadvantage is the current treatmentenvelope determined by the 650 kHz ultrasound transducer system, which limits therange of ablative power to centrally located brain areas. Therefore, our phase Istudy restricts patient selection to cases with centrally located malignant tumorsunsuitable for surgery and patients with larger tumors expanding into the thalamicregion, potentially requiring a hybrid approach including conventional surgery forthe outer part of the tumor and tcMRgFUS for the central region. Various solutionsto widen the treatment envelope are currently being intensively evaluated, such asusing lower ultrasound frequencies, adding ultrasound enhancing microbubbles, orrearranging transducer position and geometry —which presumably will extend the therapeutic potential of HIFU forvarious CNS diseases in the near future. Another issue is the attenuation ofultrasonic beam in bone (30–60 times higher than in soft tissue) [10, 22] which heats the skull and overlying skin. Following sonication of10–15 s, a 3–5-min break must be taken to allow the bone and skin tocool down. After 3 h of repeated sonication, our patient reported a mild sensationof warmth inside the head occurring several seconds after sonication and lasting fora diffuse length of time. Despite the patient asking for continuation, we decided tocease the session at the point in order to evaluate the effect on target tissue andsurrounding brain parenchyma. The post-interventional MR scans showed sharplydemarcated lesions precisely within the planed sonication location(Figures 1, 2, 3 and 4) in the tumor without any otherdistinctive changes in the surrounding tissue. 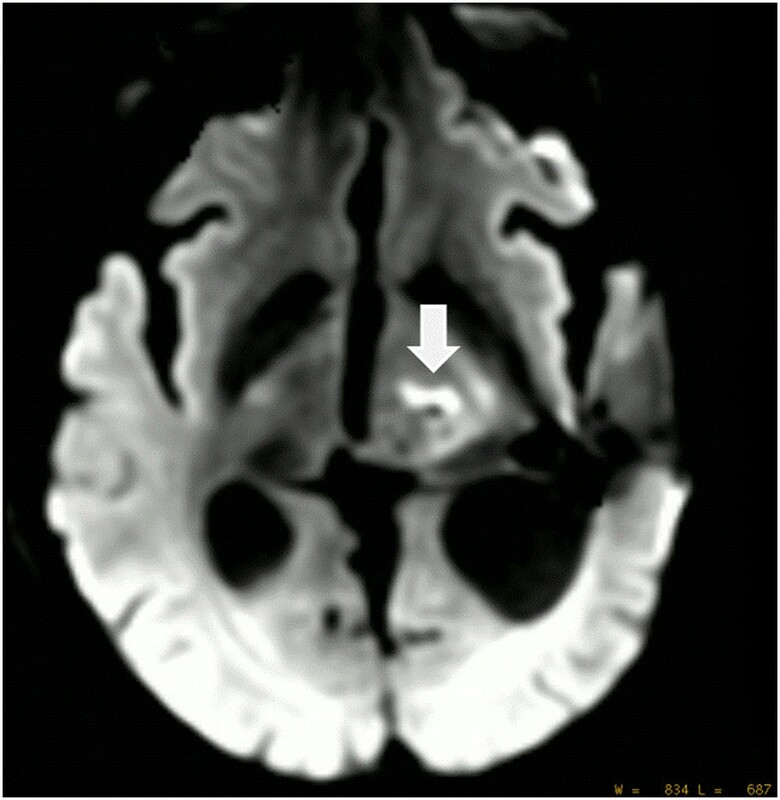 The patient did not display any newneurological deficits and was mobile directly following the procedure. 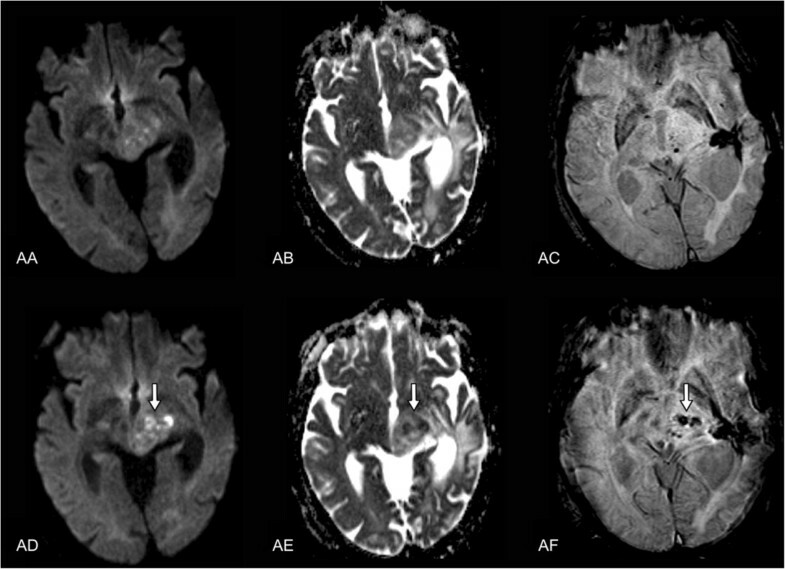 The totalablation volume of 0.7 cc achieved in a 4-h treatment session corresponds to anaverage lesion volume of 0.04 cc per sonication, which matches well with the singlepoint lesion sizes achieved in current tcMRgFUS treatments for functional braindisorders. While the total ablation volume is substantial, it is still relativelysmall, i.e., 10% of the enhancing tumor volume, and not sufficient for significantcytoreduction as is the key for sustained tumor control. However, reduction ofdisplacing effects of the tumor mass resulted in improvement of neurologicalcondition and quality of life of the patient throughout the 2-month follow-up periodcovered in this report. TcMRgFUS is a highly promising technology which has the capacity to improve orreplace present therapies and enable future treatment modalities . Beyond thermal ablation, HIFU has notably been shown to allow safe,nondestructive, and transient focal blood-brain barrier disruption to facilitatedrug delivery [24, 25] and is being evaluated as a tool to induce hyperthermia to enhance thetherapeutic effect of radiotherapy and chemotherapy [26–28]. Transcranial noninvasive HIFU has also been used to modulate cortexactivity in a study with human volunteers  and to stimulate deep brain nuclei . This makes HIFU potentially capable of combining lower ultrasoundintensities for tissue stimulation monitoring before the application of higherintensities for ablation. 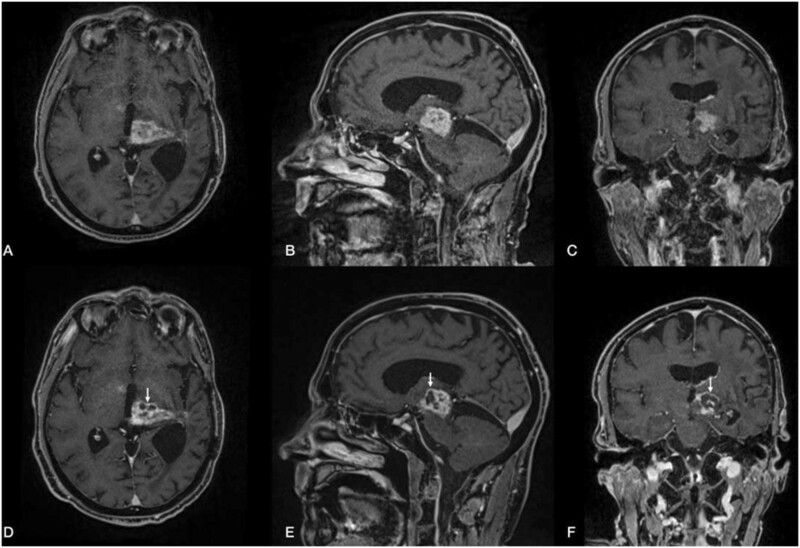 This report on successful brain tumor ablation demonstrates the feasibility ofnoninvasive tcMRgFUS tumor surgery. Further treatments in the context of our ongoingclinical phase I study will be needed to assess the safety and efficacy of tcMRgFUSin patients with malignant brain tumors. DC was responsible for the study submission to the ethics commission, the patientcare and planning and conduction of the treatment, the data analysis, and writing ofthe manuscript. JF was responsible for the patient care and planning and conductionof the treatment, data analysis, and revision of the manuscript. LS participated inthe study coordination and patient care. RO was responsible for the MR setup andintra-interventional imaging. LR was responsible for the pre- andpost-interventional MR imaging and data analysis. JA performed the image workup andwrote the figure description. EM was responsible for the study submission to theethics commission, the planning and conduction of the treatment, and the revision ofthe manuscript. BW was responsible for the planning and conduction of the treatment,the overall technical setup, the data acquisition and analysis, and the writing ofthe manuscript. All authors read and approved the final manuscript. This article is published under license to BioMed Central Ltd. This is an Open Access article distributed under the terms of the Creative CommonsAttribution License (http://creativecommons.org/licenses/by/4.0), whichpermits unrestricted use, distribution, and reproduction in any medium, provided theoriginal work is properly credited. The Creative Commons Public Domain Dedicationwaiver (http://creativecommons.org/publicdomain/zero/1.0/) applies to thedata made available in this article, unless otherwise stated.